These Government issue cans are air tight and waterproof. 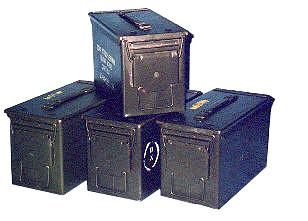 These cans are in great condition and are heavy duty. 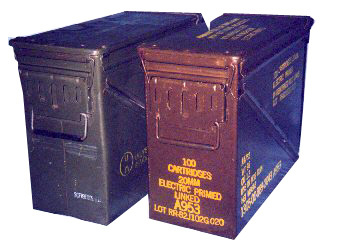 Our most popular size ammo can. All steel construction, Air and watertight. Locking hinged lid. Ideal for carrying those small easy to loose items. Measurements 3�" x 10" x 7"
Air and watertight, with locking hinged lid. Measurements approx. 11" x 5 �" x 7"
Measurement approx. 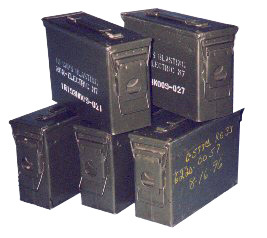 12" x 7" x 9"
Big rugged all steel Ammo can. Ideal when you have a lot to store. Air and watertight non-hinged lid. Measurements 17�" x 14.�" x 8"